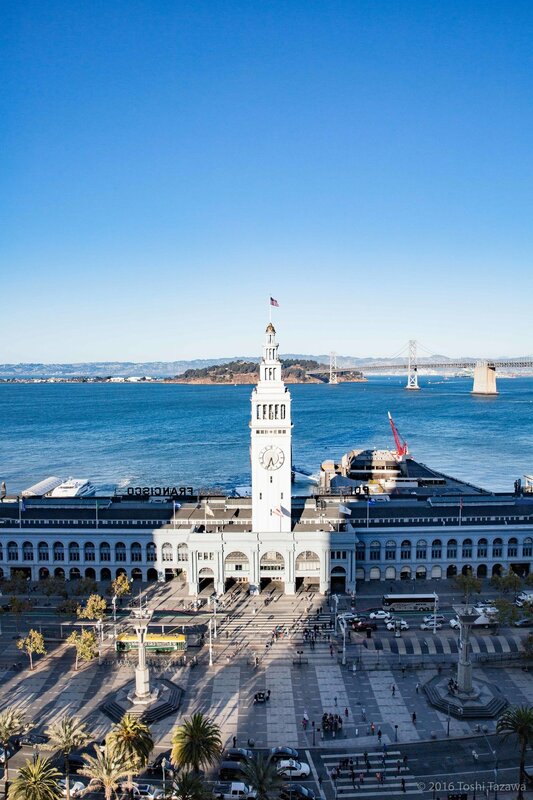 An iconic shot of Ferry Building from the Justin Herman Plaza. Many missed this shot, but here's a sample of what you get above the hustle and bustle of the ferry and stores on first floor. Many missed this shot, but here's a sample of what you get above the hustle and bustle of the ferry and stores on the first floor. Another frame rendered in B&W. Yet another take of the two structures. 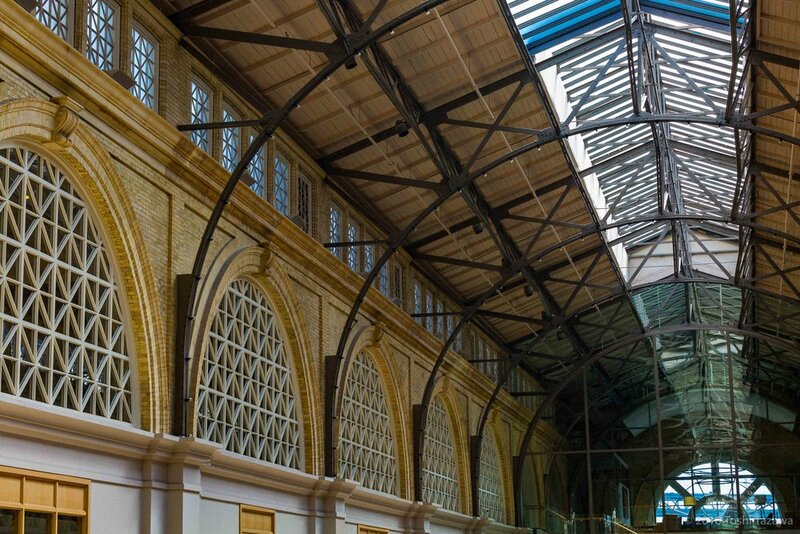 Yet another take of the two structures. Another frame with desaturated treatment. Giants 3 - Dodgers 0! We did actually get to see some of the late season rivalry between Giants and Dodgers from the free viewing area. By the time we started around 3:15 PM, the game was over! Go Giants! Just a detail shot of the Park Emblem. Another frame rendered in B&W. Just a detail shot of the Park Emblem. 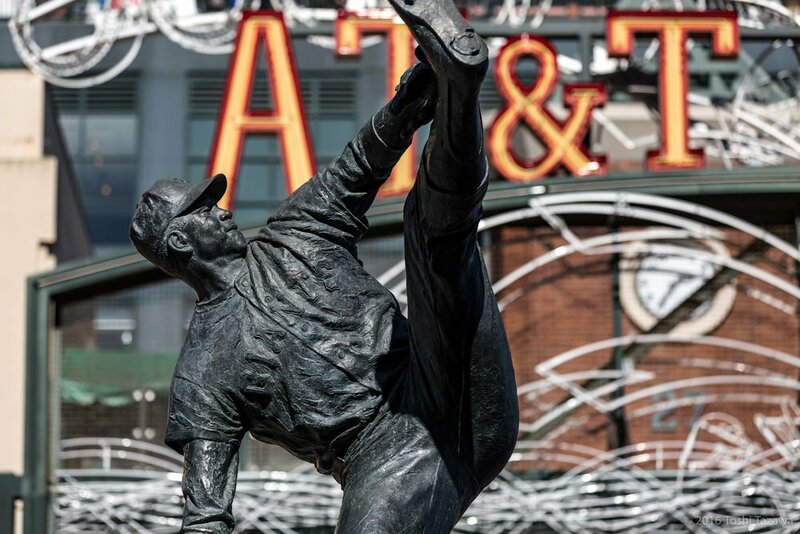 The two Marichal Statue shots are interesting one in that you can see the effect of long lens compression. This one was shot at 70mm and you can see the AT&T marquee in relation to the statue. 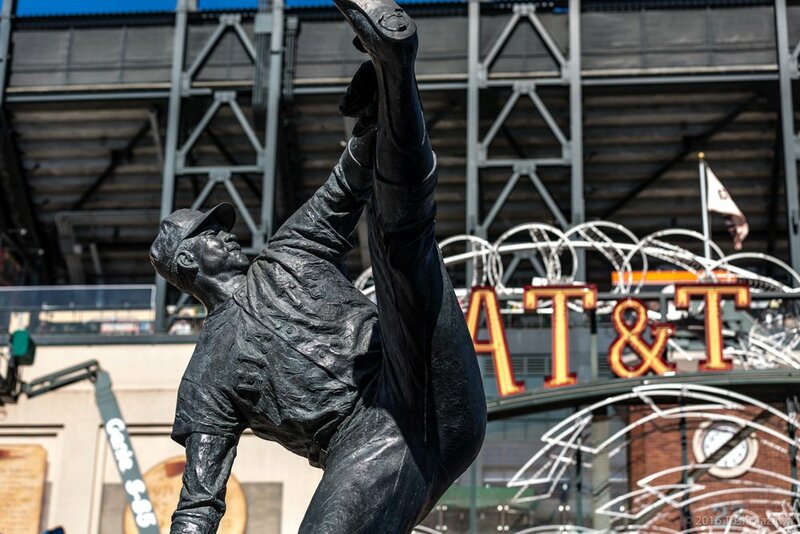 The two Marichal Statue shots are interesting one in that you can see the effect of long lens compression. This one was shot at 155mm and you can see that AT&T marquee now overwhelmingly hovers above Juan with the 70mm zoom focal length. Compositionally, you'd want to shift your vantage point to the right to avoid the trees growing out of Willie's head, but I really like this angle to get the best expression of Willie Mays presumably glancing down the field as his hit sails toward the outfield... Another frame rendered in B&W. 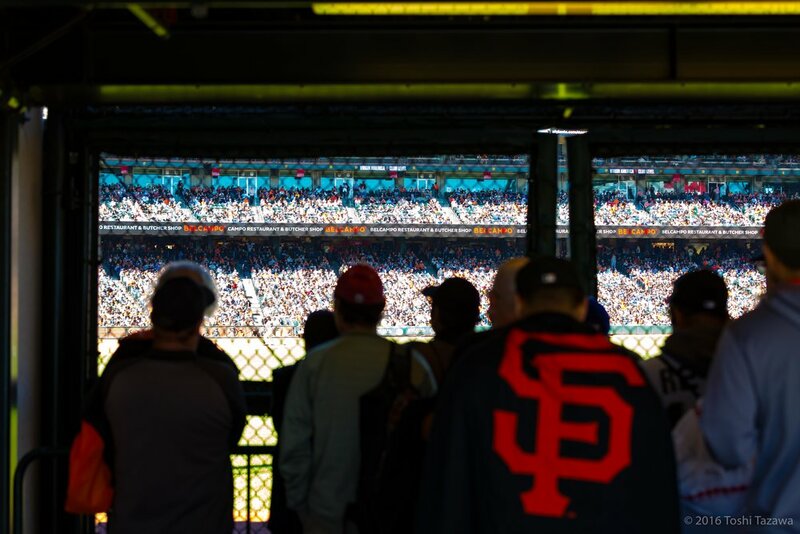 View of the AT&T Park from the South Beach Marina. 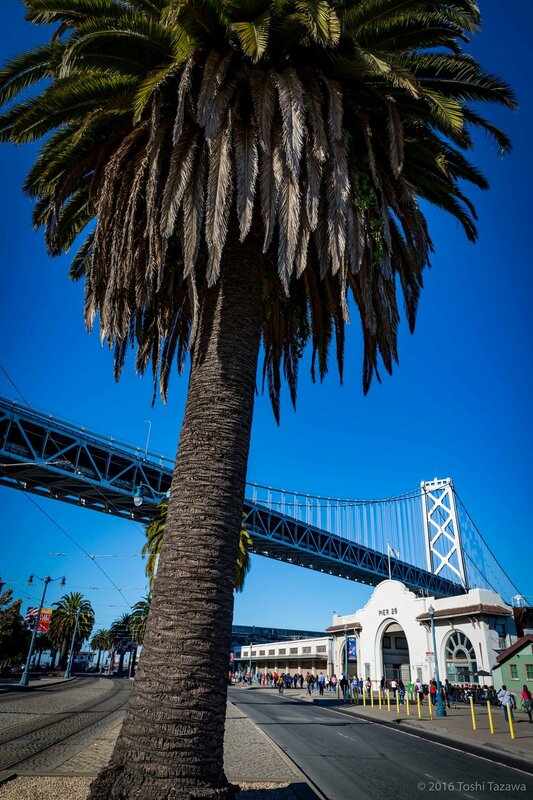 Shot of Bay Bridge from the center of Embarcadero. Another shot of Bay Bridge from the center of Embarcadero in portrait orientation. An iconic store in front of the Bay Bridge. Pier 30. An iconic store in front of the Bay Bridge. Pier 30. Another frame rendered in B&W. 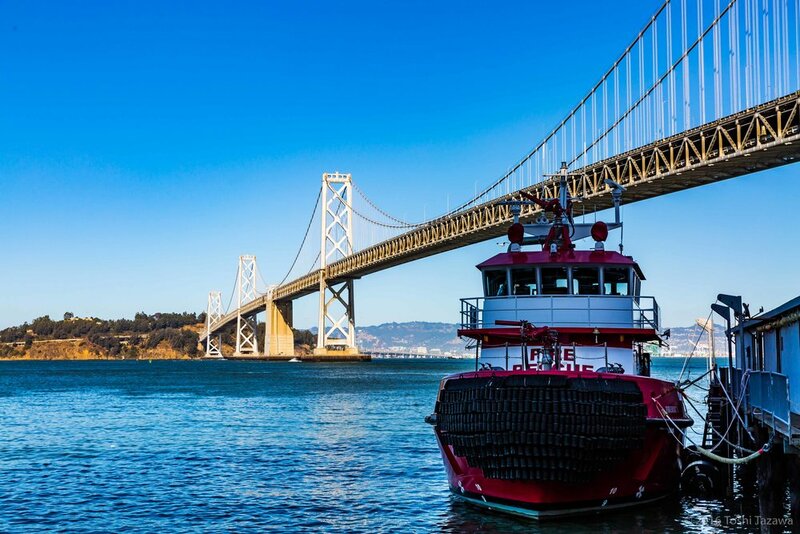 Bay Bridge with the bright red and white Fire Rescue Port Authority Boat in front. Your plate shot background for Engagement Portraits with the sunburst. Shot at f/11 with 1/800 sec exposure to attain the obligatory sunburst. Your plate shot background for Engagement Portraits with the sunburst. Shot at f/11 with 1/800 sec exposure to attain the obligatory sunburst. Another frame rendered in B&W. Another shot of Cupid Span this time from the South Beach side looking out toward the Bay Bridge. Shot with Ultra Wide 14mm. Another shot of Cupid Span this time from the South Beach side looking out toward the Bay Bridge. Shot with Ultra Wide 14mm. Another frame rendered in B&W. Vantage point from the south side looking towards the Ferry Building. Another frame rendered in B&W. Vantage point from the south side looking towards the Ferry Building. 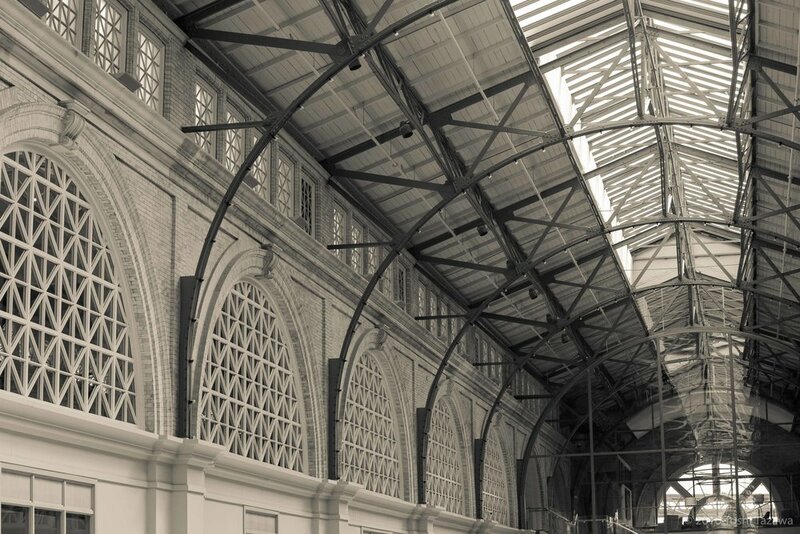 This was an optional leg of the Photo Walk where we snuck into the fire escape of Grand Hyatt's top most floor to get the best perspective of the Ferry Building. Harsh light had cast shadows to both sides of the building, but fortuitously the moment we arrived for the shot, the center tower was lit perfectly. Another frame rendered in B&W. 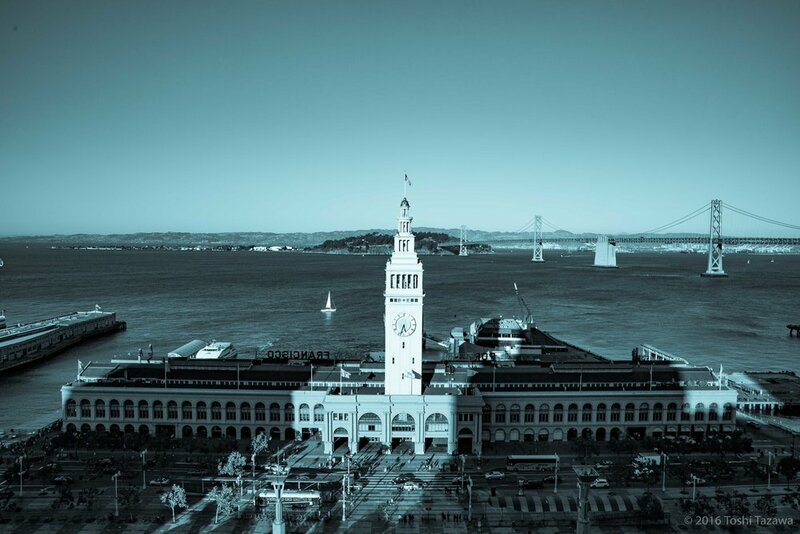 This was an optional leg of the Photo Walk where we snuck into the fire escape of Grand Hyatt's top most floor to get the best perspective of the Ferry Building. Harsh light had cast shadows to both sides of the building, but fortuitously the moment we arrived for the shot, the center tower was lit perfectly.Another frame rendered in Cyanotype. 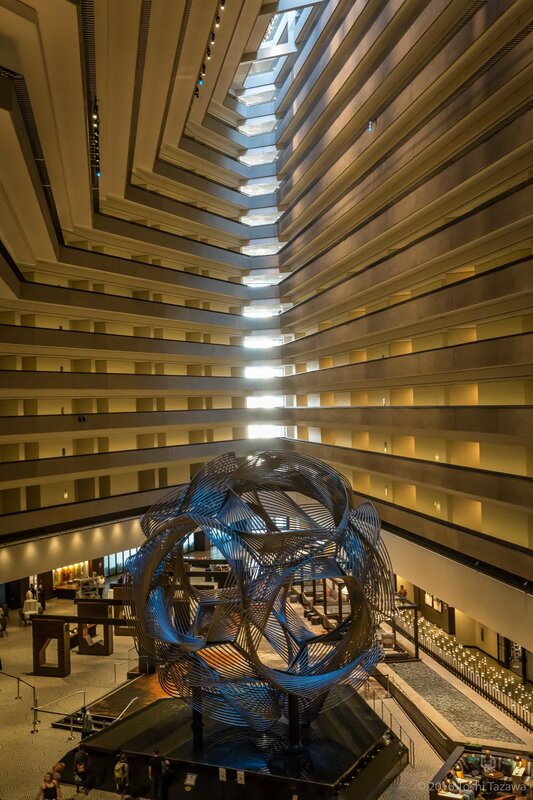 There are very few 1970's architecture that can still instill awe and Grand Hyatt is certainly one of them. This is a shot from the fourth floor using 24-70mm racked to about 40mm. There are very few 1970's architecture that can still instill awe and Grand Hyatt is certainly one of them. This is a shot from the fourth floor using Ultra Wide 14mm. 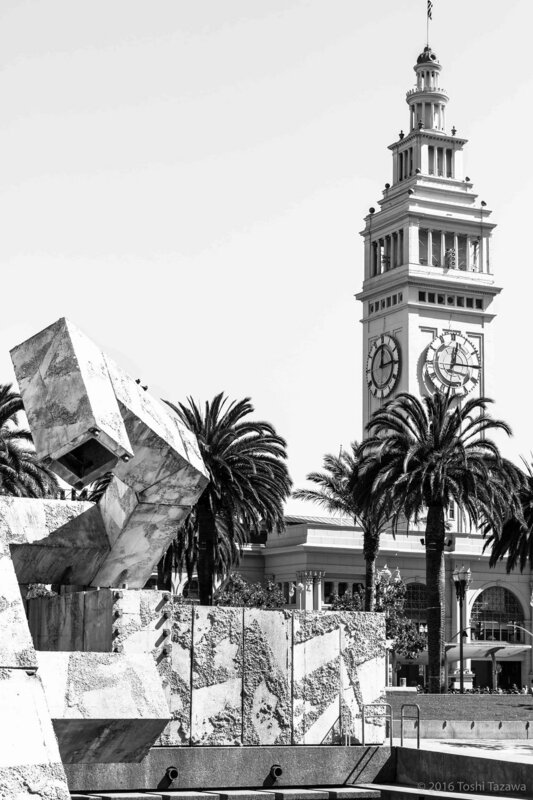 Another take of Justin Herman Plaza with Ferry Building. This time, the water structure takes center stage shot with Ultra Wide 14mm and LR Clarity set to negative to generate that soft focus. There were many interesting Street Cars that passed along us during the walk. This bright yellow car seemed to draw my attention the most. This was the last location for the day and one of my favorite spots to take couples portraits at dusk. 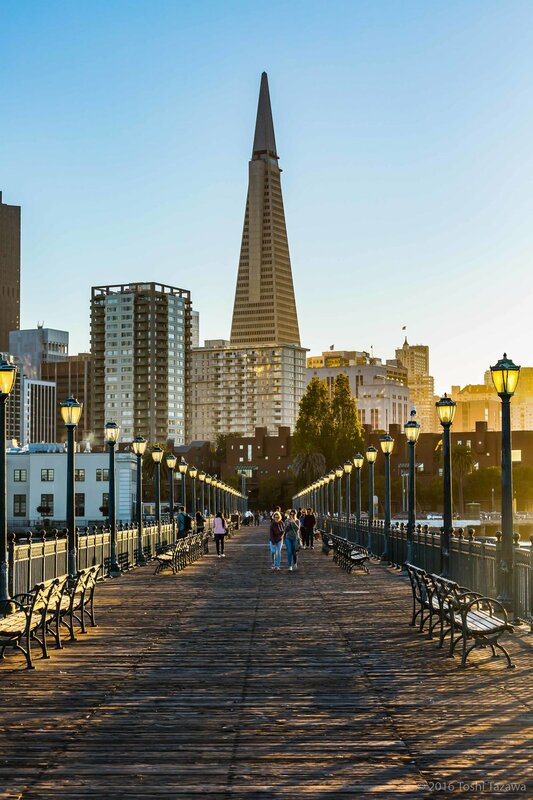 The symmetry of the ironwork lamp posts create a remarkable vanishing point toward the base of the Transamerica tower. Interestingly, the lamp post probably were not lit at the time I took the shot, but the reflective coating on the lamps appear always around this time to cast gentle light along the promenade. 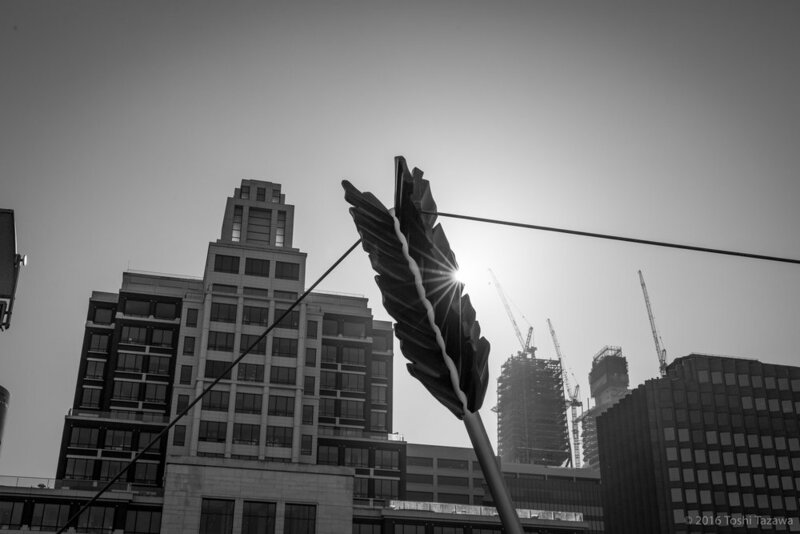 Thanks to everyone that participated in this year's World Wide Photo Walk! This was my very first year leading the Photo Walk and I had loads of fun getting to know everyone and talking about photography in general. Thanks for everyone that's either donated or purchased T-shirts to raise funds for The Springs of Hope Kenya Orphanage. I'm looking forward to find out the final tally for the fundraising total soon! I'm also looking forward to everyone's submission for the photo contest. For the prize details, please refer to the following link http://worldwidephotowalk.com/prizes/. That $6,050 Grand Prize with EOS 5D sure looks like a great prize to win. I set out this walk to be full of photo opportunities and I don't think the abundance of landmarks and settings did not disappoint anyone. For me, the walk this year has become a familiar one for being the go-to location for engagement shots and a fun walk in general.